"Hi there! I'm known around here as Tuxedo Thomas. That's because I have such a handsome black and white coat." "They say my markings are particularly striking. Yep, I'm all dressed up ready to go home with you! I've had quite an adventure lately. I can't tell you how it happened, but somehow I found myself all alone on the street. Even worse, I had a bad wound on my leg. I was feeling pretty alone and scared as you can imagine. But then I got really lucky! A Good Samaritan found me and brought me here to Great Plains. They take great care of me here. The great vets here fixed up my leg, and now it's all better! Plus, I've got a nice warm bed, lots of yummy food, and volunteers who love me! That's the best part! I just love when the volunteers spend time petting me and talking to me and cuddling me!!! I was a little scared when I got here, but I'm starting to see that life is getting so much better for me. And now they tell me that someday soon my forever person will come and fall in love with me and take me HOME!!! I can't wait!!! I have so much love to share! I just need someone to share it with---forever!!! 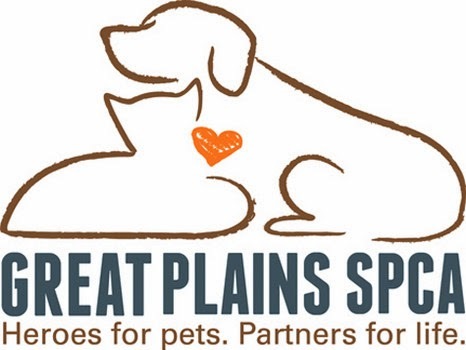 Won't you please come down to Great Plains to see if we're a match? I'm easy to spot--wearing my trademark tuxedo and waiting for you! 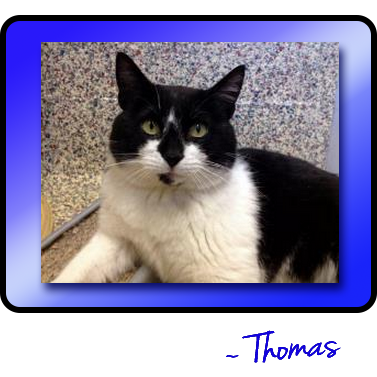 Thomas is available - along with almost seven hundred(!) of his shelter mates - at the Merriam campus of Great Plains SPCA. Thomas, you are very lucky my human lives too far away to adopt you - with her bad judgment about cat names, she would probably wind up calling you Diamond Nose! Thomas, you're a handsome guy! We hope you (and your 700 shelter mates!) are on your way to a new forever home very soon!